Neil Robertson beat Graeme Dott by 18 frames to 13 at The Crucible Theatre in Sheffield to take the World title 'Down Under' for the first time in the tournament’s 83 year history. 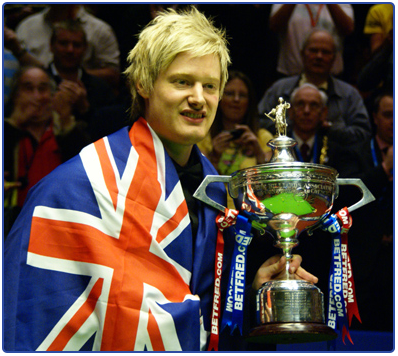 Neil Robertson became the first overseas winner of the World Championship for thirty years and it took him a grueling 12 hours and 12 seconds to clinch the title, over the battling Scot Graeme Dott. Resuming at 9-7 ahead, Robertson shared the first six frames with Dott and time was called to allow the players some rest before the final evening session. Dott opened the day with 79 to close to within a frame, but he could never get level, and Robertson fired in a best run of 82 to go three ahead. Dott dug deep to produce his best break of the match, 112, to trail 12-10 ahead of the evening session. Both players were afforded a tumultuous welcome to the final session. The pattern of the evening was soon sort to become grueling match play, with Dott closing to within a frame and Robertson re-opening his two frame lead. Robertson then clinched the pivotal frame, an energy-draining 44 minute frame, on the pink, to go 15-12 ahead at the final interval. Dott battled to keep in touch. He won frame twenty-eight on the pink, to trail 15-13. But that proved to be his last success as Robertson, pushed on for the winning line. Eventually he sank the winning 53 break at 00.54am, equaling the latest Crucible final finish, set in 2006 by Dott and Ebdon. Neil's mother, who had flown in from Australia, embraced her son in the arena, as Australian flags and koalas and kangaroos and other Australian ephemera appeared all round the arena. As Robertson received the trophy from BETFRED.com boss Fred Done, and WSA Chairman Barry Hearn, ticker tape floated down from the Crucible roof. The crowd cheered long and hard and Robertson did a 'mini' lap of honour, parading the trophy around the arena, proudly draped in the Australian flag. The small number of Aussies in the audience managed to make the most noise and cries of 'Aussie, Aussie, Aussie' resounded around the famous arena. Robertson's success moved him up to Number Two on the World Rankings, while Dott has regained his top 16 place to finish at Number Thirteen. A thrilled Robertson said after the final: "It feels incredible. I seriously can't believe it. In my last 16 match I was 11-5 down to Martin Gould, so to have won is amazing. My mum being here is just brilliant, it's a wonderful feeling to have won. It would have been awful to have lost in the final. Hopefully this will start something special in Australia now. Australians love world champions." Dott was gracious, as well as exhausted, in defeat praising the new Champion, saying: "Neil thoroughly deserved to beat me, how I managed to get 13 frames is beyond me. I'm just disappointed I didn't perform in the final, but fair play to Neil, because he played really well." Asked whether the weekend's off-table events had affected him and how he heard the news Dott explained that he'd learned "the same way as you guys", implying he'd read it in the papers. He asserted that it hadn't affected his performance in any way nor overshadowed the final.